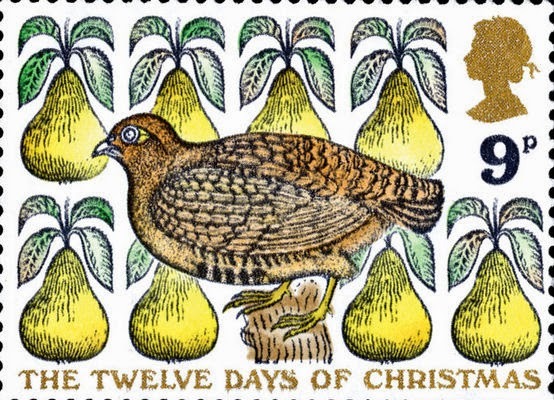 Medieval Morsels: Partridges in pears trees? Well its almost Christmas, there is a Cadbury's advent calendar in the house. But my thoughts turned to the old rhyme "The Twelve Days of Christmas". Surely it must be medieval in origin? Specifically I was keen for MedievalMorsels to offer 12th scale miniature pears by this December, to accompany my dollshouse miniature partridges. Mission accomplished this week! Strictly a ground bird the partridge was never likely to be found in pear trees! This misunderstanding seems to have arisen from mistranslation of the French song. Une perdix is French for a partridge and une perdrix for a pear tree! An easy mistaken association for an English speaker to make in translation. I have an ambitious plan for next year, which will rely on abundant medieval themed poultry! Namely scale models for a Medieval or Tudor dolls house. Two turtle doves and three French hens will be required. I think either in their plumage, or toasty and spit roasted! There is little obvious difference between a pigeon and a turtle dove when its roasted luckily for me. I suspect from research I have done, and the stamp seems to bear this out, that French hens were a short-legged variety. At the minute I just model a standard chicken - but is a fat neutered male - a capon. Four calling or colley birds - I will certainly need to find out about these. From the stamp they look like a member of the corvid (crows, ravens etc) family but perhaps the smaller blackbird, known for its beautiful song and thus a calling bird? Six geese present no problem, nor their eggs. My biggest challenge will be seven swans swimming atop medieval pies. There are some stupendous models out there. I may have to make a medieval swan-shaped biscuits instead. Lets see how my modelling progresses in 2015!